I often find that bodices don’t fit me very well due to my wide shoulders, low slung armpits and slightly larger than normal bust. Fitting books almost always talk about bust adjustments but rarely about other adjustments needed around the shoulder area. Recently, however, I came across “Fitting and Pattern Alteration” which is a very comprehensive book talking you through every possible fitting issue you could come across and giving you several techniques for resolving them. For a first attempt I decided to down load the Scout Woven Tee pattern. I could do with some casual tops and as this is a simple pattern with a very relaxed fit I thought I could use it to try out some of the techniques. The pattern is actually a lot more simple than I expected and has no darts or bust shaping of any type. By comparing it to Dolly and to the shirt I was wearing I could see that the armscye needed lengthening and the shoulders widening. I wasn’t sure by how much but I made some crude guesses and put an additional 3cm into the armscye and 2.5cm across the shoulders. 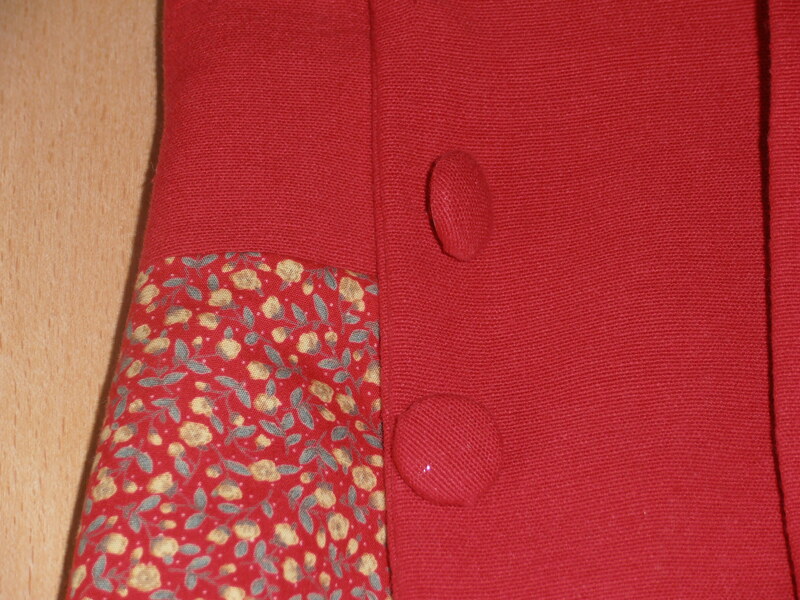 I think these alterations will be much larger than I actually need and if that is the case I can reduce them later. I chose to use the slash method of alteration which involved a lot of Blue Peter style gluing. 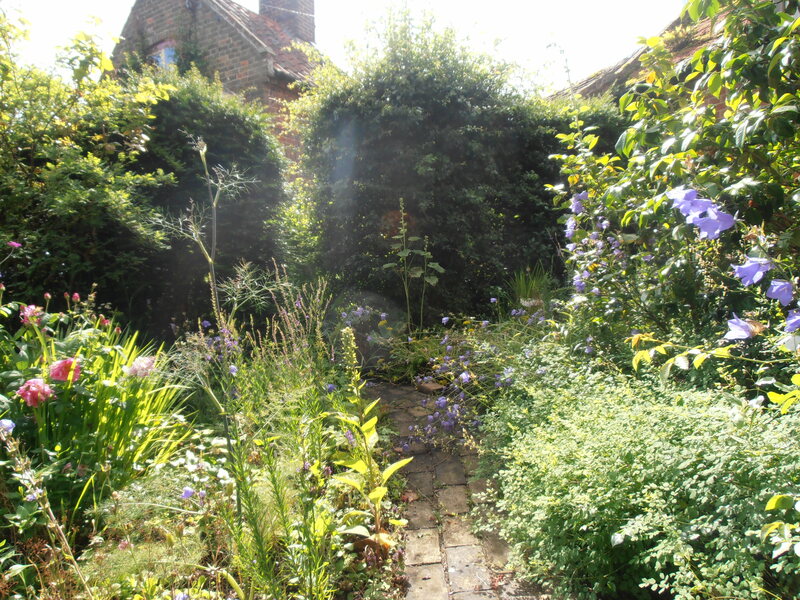 The next step is to make up the top – I have a pretty floral print which cost me next to nothing so if it doesn’t work out all will not be lost! 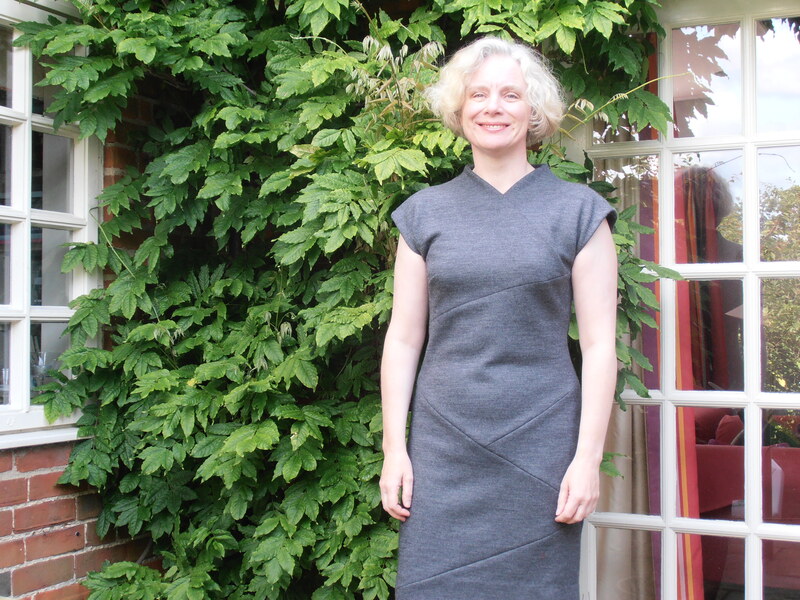 I have been keen to make this dress since I first saw it in Burda’s February issue. Pictures of the dress made up on Fehr Trade, Sew Tawdry and Cyberdaze (twice) made me even more enthusiastic. I used some thick, stable, wool-polyamide double knit jersey bought from Cloth House in Berwick St. Unfortunately the first length I bought shrunk in the wash but Cloth House were brilliant and kindly replaced it. It’s a stable knit and was very easy to sew using my Toyota set on a medium width zig-zag. Pressing was another matter, being quite thick it needed a lot of brute force and ignorance to get the seams to lie flat, particularly where the different triangles joined together. 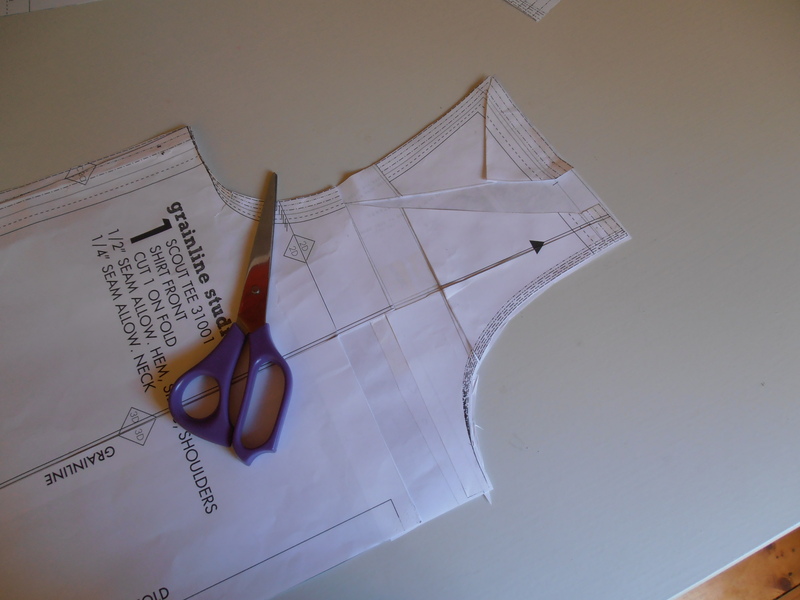 Once I cut out the fabric, sewing it together was relatively quick. 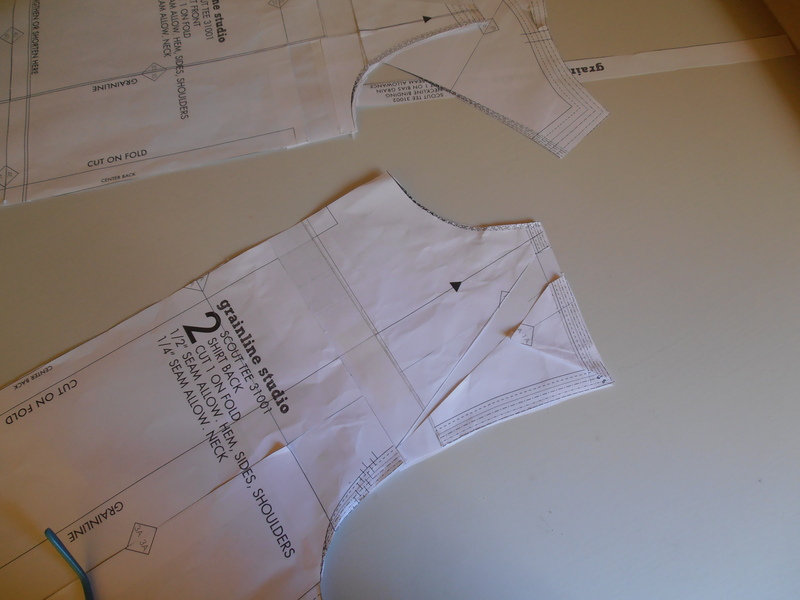 This pattern had “sewing course” instructions which were a bit more detailed than the usual Burda instructions, even so I found I had to concentrate a lot to ensure all the seams lined up. A sideways picture of the dress would have helped; even now I’m not sure whether I got my upper left front seam in quite the right place. 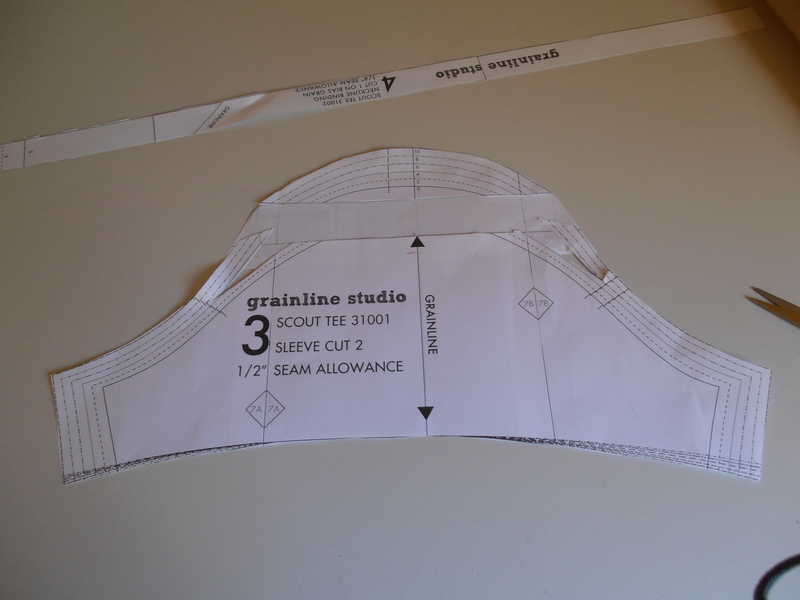 My first attempt at the main triangle on the front skirt piece had the tip buried in the seam allowance. I was quite tempted to leave it but after seeing Catherine’s red dress I decided to unpick it and rework (I’m glad I did my little perfectionist streak would have yelled at me every time I saw the dress had I not). 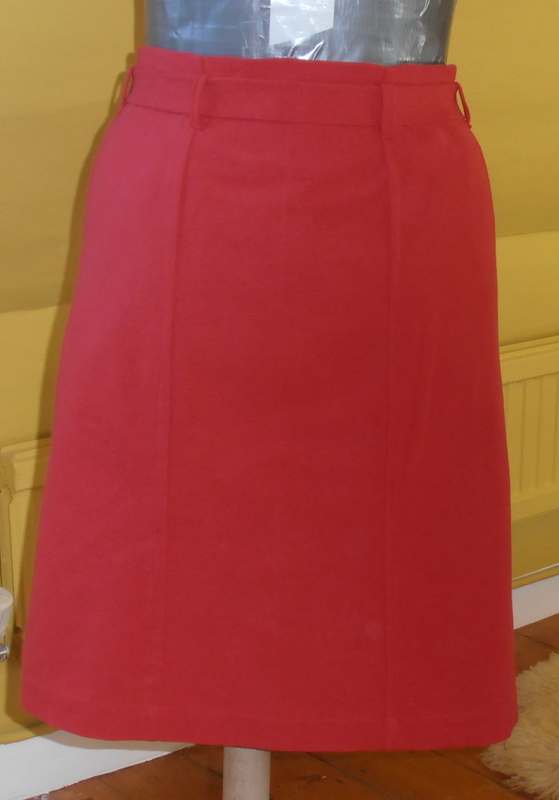 I didn’t include the shoulder pleats, once I’d sewn up the arm holes I decided I liked them as they were. Also I made the dress 4cm shorter than Burda’s version, which would have come to my knee and looked to my eye a little frumpy. The pattern goes a bit overboard on fasteners and asks for a two way full length zip in addition to 3 poppers for the front. As it’s a knit dress which pops over my head quite happily neither of these are really required. In the end I included the zip (1m long from Klein’s in Soho – I managed to get there on one of the rare occasions they are open) but sewed up the front opening. If I were to make it again I would probably go for a smaller size. The back in particular seems to be quite big and I am getting a little gaping at the back of my neck. In this thick knit it doesn’t matter too much that’s it’s slightly large, but if it were in a stretchier fabric it would show. I’d like to make this dress again with sleeves for winter. I don’t think a sleeveless dress is entirely practical for someone who feels the cold and putting a jacket over the top would spoil the impact of the back detail. Oh! 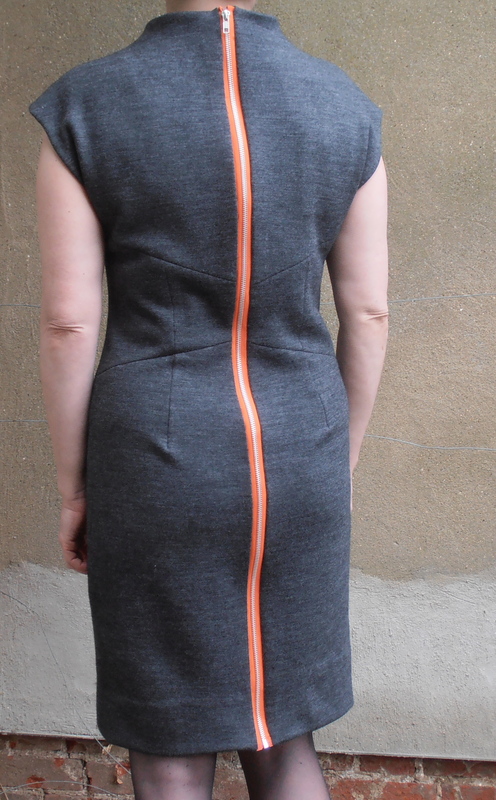 I haven’t shown you my favourite bit………………the orange zip maybe not be to everybody’s taste but I love it. Is there anything more satisfying…. 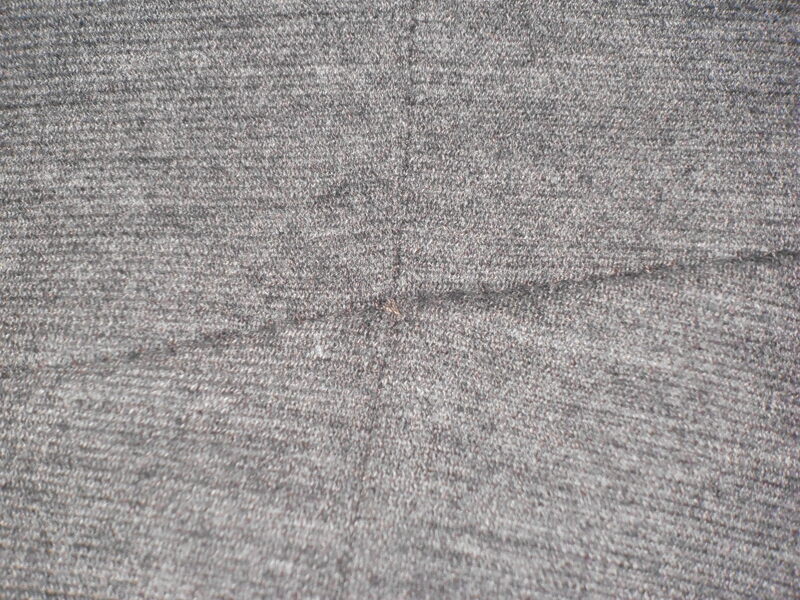 …than a well matched seam? My second beignet! I started this one by redrawing the pattern with all the adjustments I made last time to make it quicker to reuse in future. This pattern is such a classic design that I can see it being used several times again. The red fabric comes from Ikea and was very cheap. It’s a thickish cotton (as you might expect from a furnishing fabric) and I’m a little worried that it might not be very resilient; it lost some colour during the pre-wash and I suspect may fade further. Having said that it’s such a good colour now I’m more than happy with it and if it does fade it won’t take long to make a new replacement skirt. The lining is made of floral poplin from Ray Stitch in Islington. I self-covered the buttons (much easier than I had anticipated) and made a bow belt using Tilly’s tutorial. 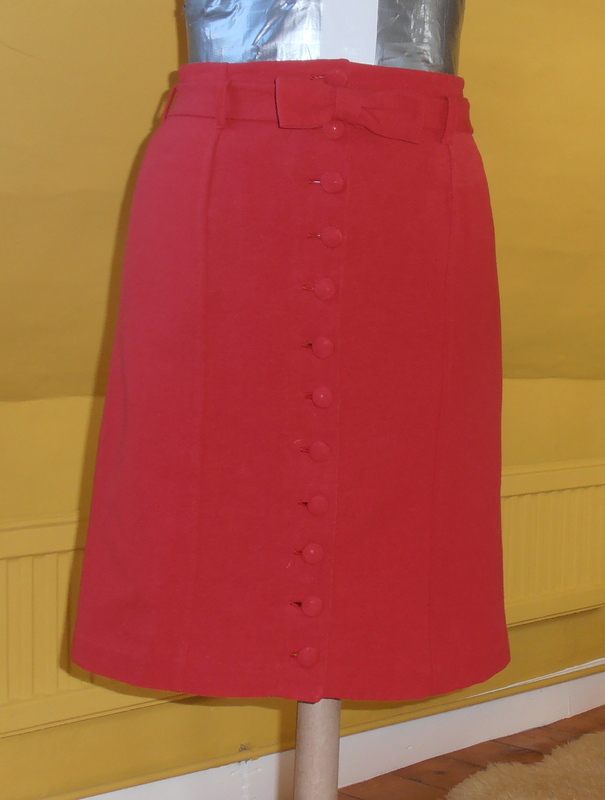 The front and back seams are flat felled which gives a neat appearance to the skirt – I think I’ll do this again next time. As before the most difficult piece was sewing the belt loops. I made them slightly larger than the pattern calls for (in part because my belt is wider) but even so had to fudge the sewing together as I couldn’t get them to work using the pattern instructions. As you can see I have modelled it on Dolly, one problem I’ve discovered is that she really needs a diaphragm. I have no problems putting the skirt on myself as I automatically breath in when I put a waistband on, unfortunately for Dolly she doesn’t have this facility which makes doing up the buttons quite difficult! As with the grey beignet I made a couple of weeks ago I can see this becoming a real favourite and one that will be worn and worn. 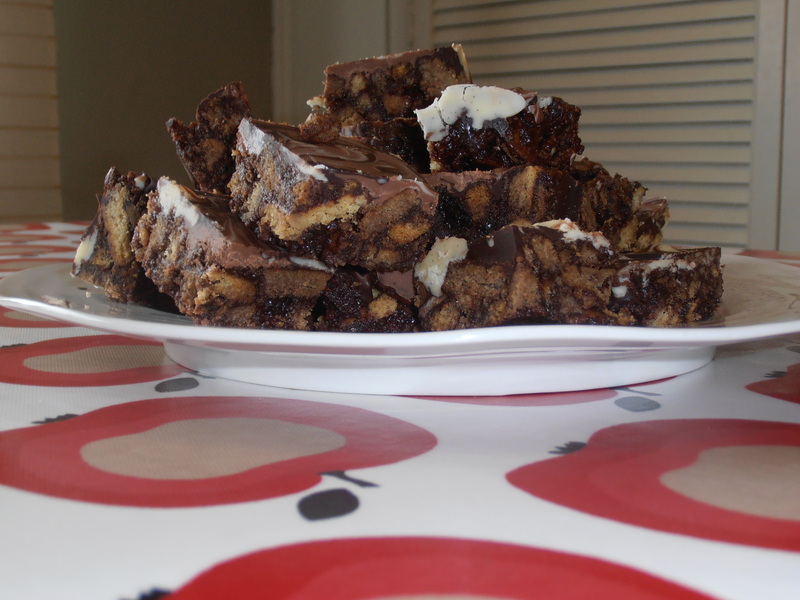 We always called this chocolate fudge biscuit when we were kids but these days it seems to be called chocolate refrigerator cake or tiffin. Either way it’s simple, yummy and very rich! 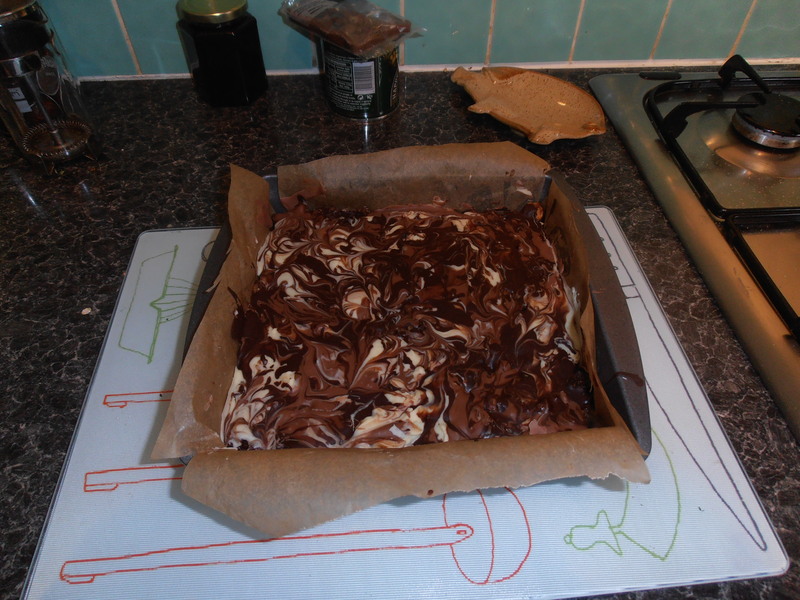 Melt 165 g butter with 3 tbsp of golden syrup, 1 1/2 tbsp of sugar, 3 tbsp of cocoa powder. Add 340g of crushed digestive biscuits (rich tea’s are a good alternative) and 75 g of dried fruits (raisins, currants, sultanas, glacé cherries – whatever you have to hand). Squish into the lined cake tin and press down until flattish. Melt 300g of chocolate and spread over the top. I got a bit adventurous at this point and used 100g each of dark, milk and white chocolate which I blobbed all over the biscuit and ran through with a skewer. Place in the refrigerator over night (or as long as you can stand) then turn out, cut into squares and eat!